Up before dawn, we headed out early to I-84 and Central-Northern Oregon. We were aiming for the mountains on the Washington side of the Columbia, east of Hood River. 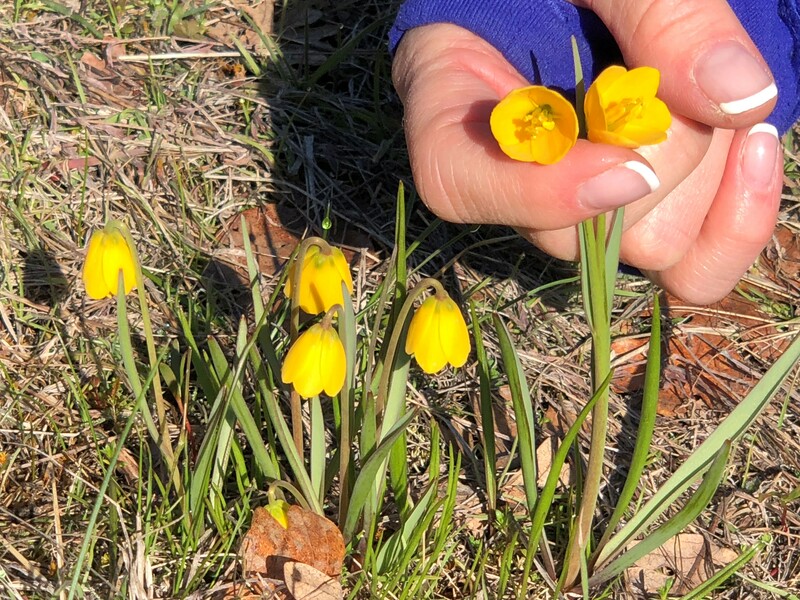 Our goal was to take advantage of Spring Break to get an early glimpse of the spring flowers in the Gorge. 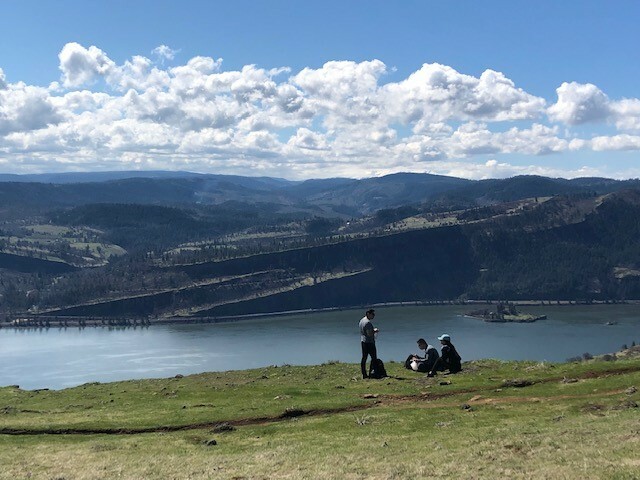 Touted as THE BEST springtime loop for hiking and flowers in the Gorge, we depended on the flower experts and the weather watchers to guide our choice. The Curious Gorge guidebook advised, “Expect wildflowers galore, unique terrain, waterfall-laden streamlets, mountain and river views — The total package!” And they were right. 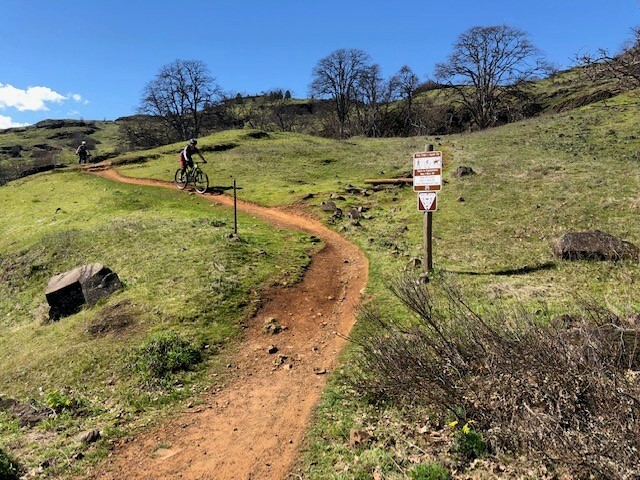 We found our way along Old Highway #8 east of Bingen, Washington, to the trailhead of the Labyrinth Trail and Little Maui Loop. 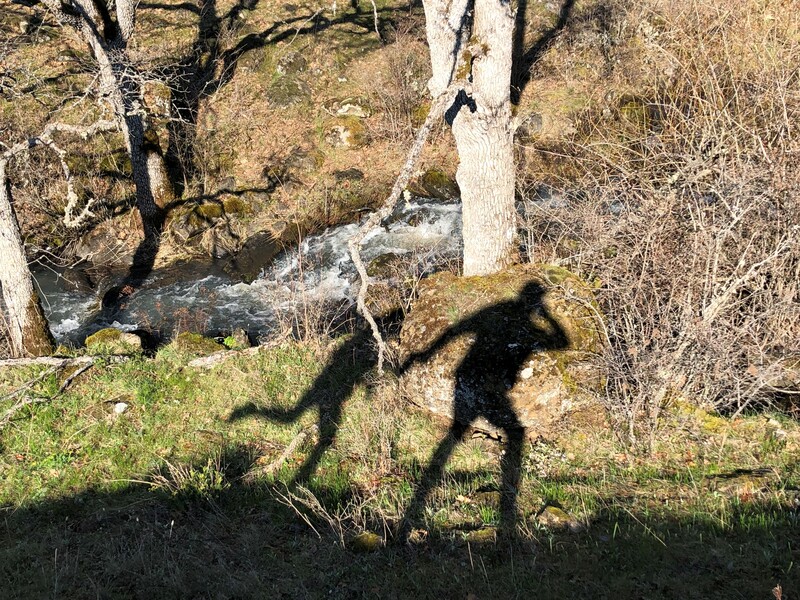 The quazi-loop was reported to follow the milky stream of cold-cold water up a 1,200 foot vertical climb through a zig-zag of trails to the top of the ridge in Southern Washington, for the best views of the Gorge and the Cascades. 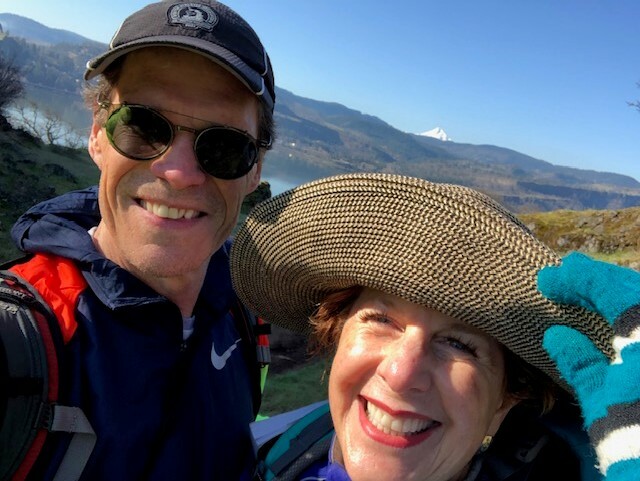 We followed the old frontage road (blocked from car traffic by a rock slide and a gorgeous waterfall) to views of Mount Hood and the lava escarpment to the north. We climbed up the swerving, rocky terrain for 1.3 miles to a path across the fields and then after another mile the trail hit a junction with the former Atwood Road. Now a two lane bike and hiking path in the area, the road creates the hillside portion of the Labyrinth Trail. 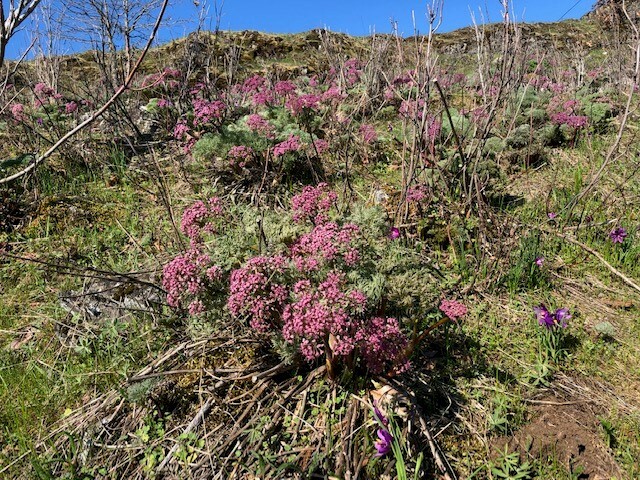 Along the way we heard the calls of flickers and meadowlarks in the brush and we spotted a vast array of purple wild flowers basking in the sunlight: mostly grass widows and gorge parsley. 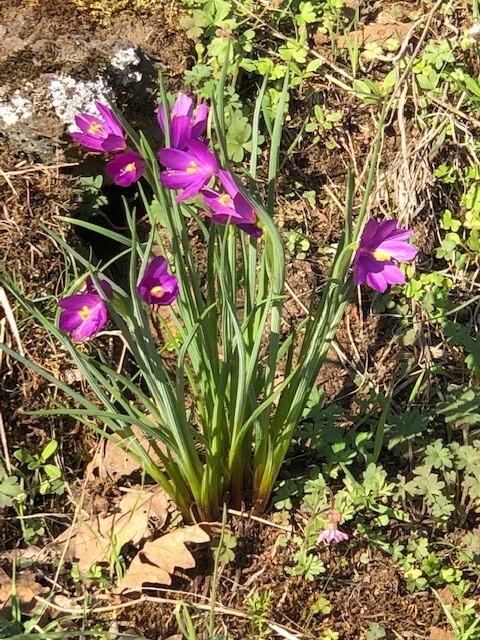 Grass Widows: Sisyrinchium douglasii, also called Olsynium douglasii. 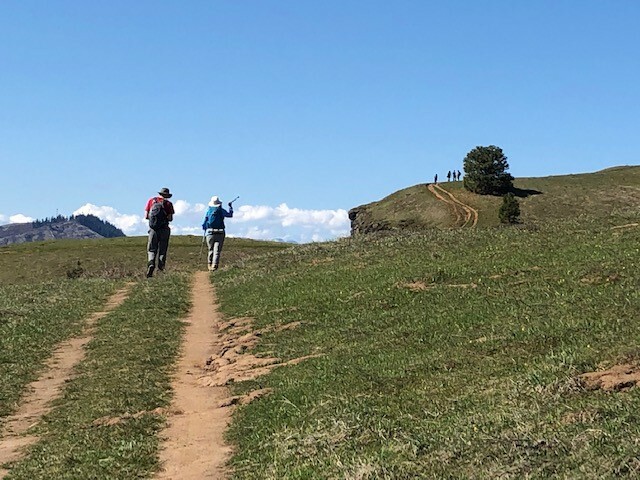 The trail traverses the grassy slopes, which all lean and flow toward Coyote Wall, the magnificent syncline in the area. We stopped for lunch on one of the knolls, as the bikes zipped by, fearless of the declines toward the Columbia. Along the way we saw turkey vultures, crows, violet-green swallows, western meadowlarks, ravens, sea gulls, mourning doves, and Oregon juncos. As to insects, we saw some small butterflies, before we identified a magnificent Mourning Cloak butterfly on the path. 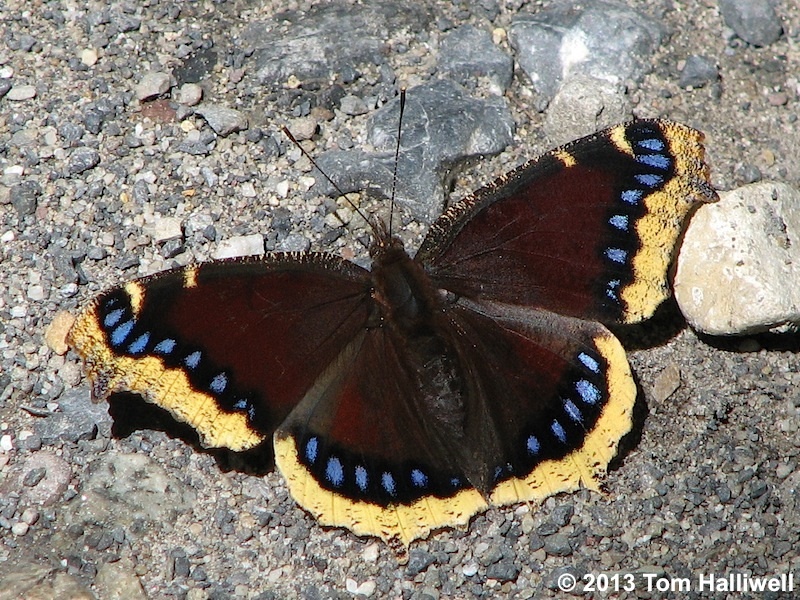 The Mourning Cloak is always an eager fritillary in the spring days of Oregon. 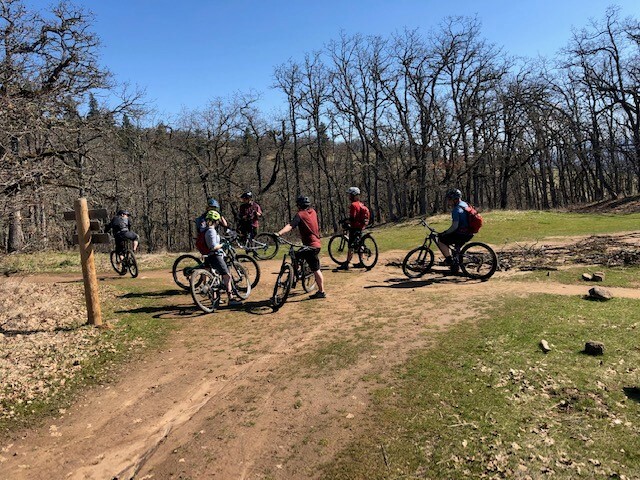 The trail was steady going up and the bikers, with great aplomb, were able to get up these steep slopes without getting off their bikes, for the most part. 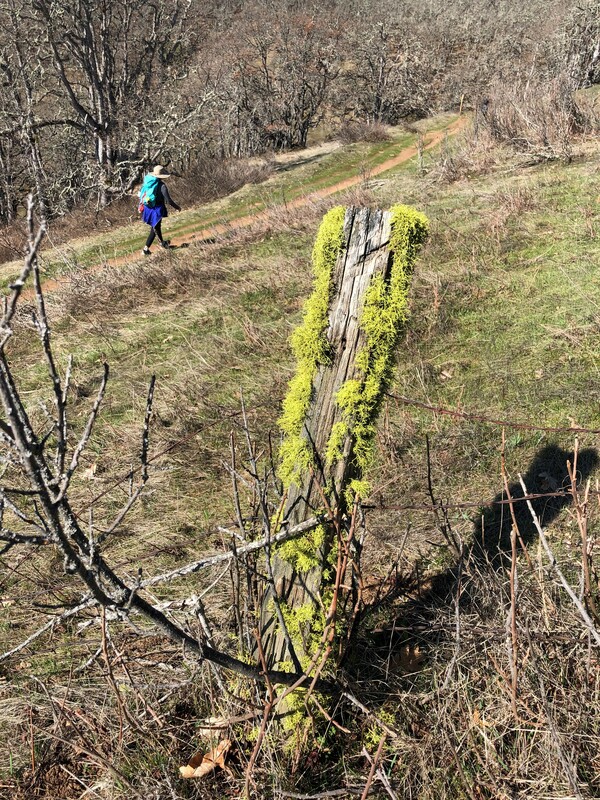 The trail carefully sidestepped some private property, which has spectacular views of the Gorge and Mount Hood. We tried to find the descent on a trail known as “Little Maui,” which we missed completely. The trail was supposed to fall in the middle of the Coyote Wall Syncline, but we did not spot it in time to make the traverse. Instead we headed toward the River and took the trail east to the trailhead where we started. 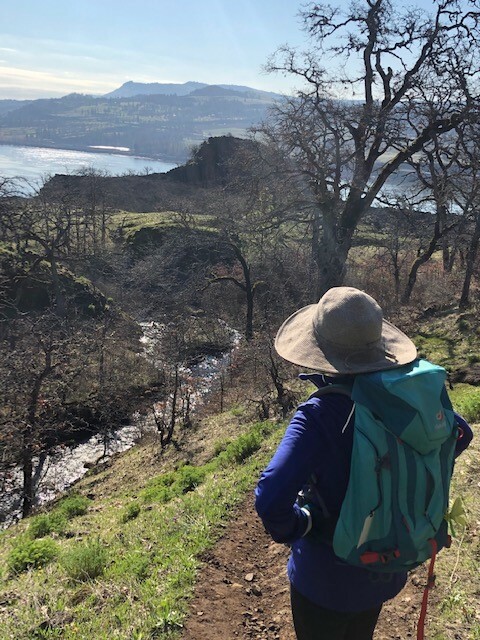 The entire loop was about 8 miles and with some quiet time for each of us, it is one of the best early spring trips we have taken in the Gorge. 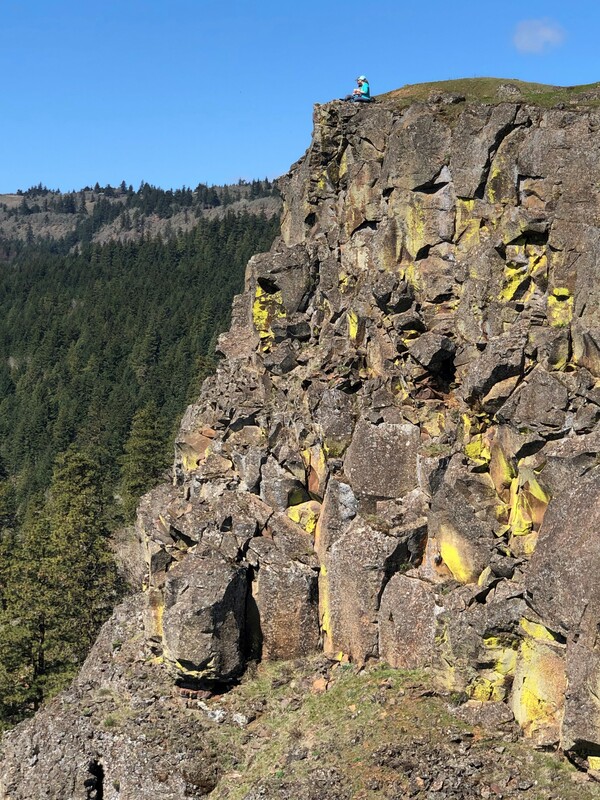 The volcanic terrain was full of surprises, like the images of Oregon’s version of Devil’s Post Pile in the middle of the hike! 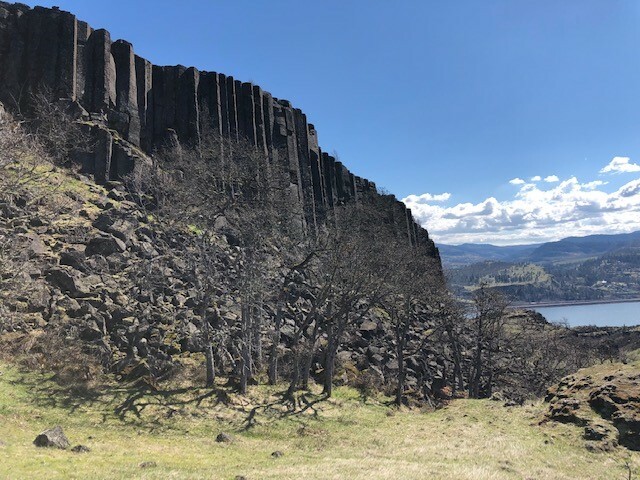 With the hikers and climbers all over the basalt cliffs, it was clearly a climbers’ destination. We walked for many miles and hours on the trails, the numbers of fellow hikers and bikers swelled as the day grew on. It was worth it to get up early and have the trail to ourselves in the cool of the day. By the end, the trails were hot and dry, dust covering our boots and legs. Back to Portland by 4:00 we showered and headed out for the night! So close to this natural beauty, we redoubled our commitment to do these treks as often as we can.